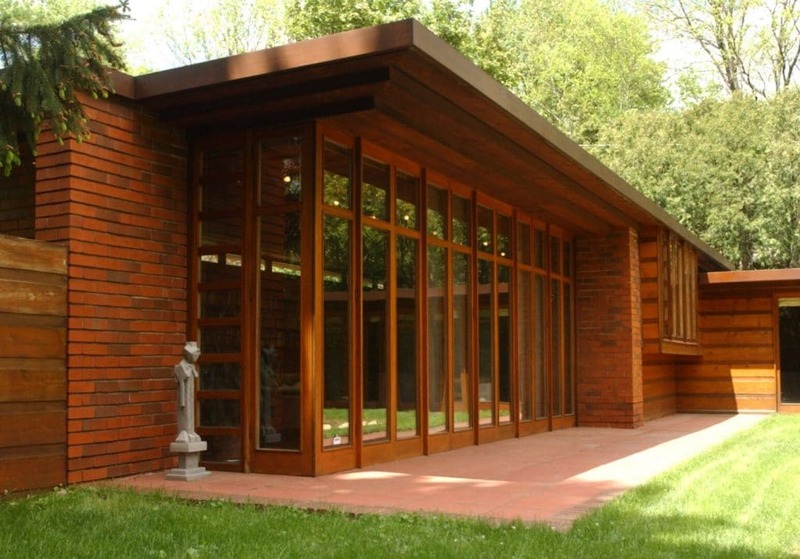 Challenged by Herbert Jacobs to create a decent home for $5,000, Wright’s design for “Jacobs I” (as it came to be known) is widely considered to be Wright’s first Usonian structure. National Historic Landmark. National Register of Historic Places. Tours available by appointment. Usonia—a name derived from “United States of North America”—was the term Wright coined to describe his vision for a new affordable architecture that freed itself from European conventions and responded to the American landscape. Wright’s Usonian houses related directly to the earth, unimpeded by a foundation, front porch, protruding chimney, or distracting shrubbery. Glass curtain walls and natural materials like wood, stone and brick further tied the house to its environment. Although Wright would go on to build over 140 Usonian houses (including the Jacobs’ second house of the late 1940s), their increasingly elaborate designs lost the simplicity and clean proportions of this early model. The Herbert Jacobs House became the prototype home for Wright’s dream vision for a utopian urban development, Broadacre City. The house’s open arrangement of living room, dining room and kitchen was also later adopted in the ranch style houses that populated post-war American suburbs, underscoring the building’s historical significance.